HTML is also known as HyperText Markup Language provides the creation of the web pages. The HTML pages are the documents that can be read by the server, and are not the best fit to be read by humans. HTML forms have the dependency on scripting languages and it results in complex document creation that consumes more time. HTML doesn’t initialize the form data properly and doesn’t make it easier for the users to enter the information once. HTML is having some limitations with the use of forms that doesn’t allow encoding formats, urlencoded or multipart forms. Code within the HTML element is displayed on your live site within a sandboxed iFrame. Using a sandbox protects visitors to Wix sites from potential side-effects of custom HTML/JS/CSS code. The script is (a lot) slower than the original FPDF and html2fpdf. Some of this is due to the inclusion of unicode font files (when used), but there is also an increase in processing time. Block elements (e.g. DIV or P) are not supported inside tables. The content is displayed, but any CSS properties which apply to block elements are ignored (e.g. borders, padding, margins etc). 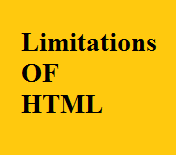 All HTML elements are hard-coded to be treated as block or in-line elements (e.g. equivalent to CSS display:block or display:in-line). This cannot be changed using CSS. See HTML tags. Several of the “special” features of mPDF are incompatible with each other e.g columns, fixed-position block elements, page-break-avoid:inside, Keep-with-table and rotated tables. Millimeters are the only accepted dimensions for defining page size and margins within mPDF (CSS stylesheets accept all usual units). Blocks which are defined as position:absolute, fixed or float have only limited support (introduced v4.0).